This trip combines the excitement of trekking to some of the most remote areas and villages in the world along with a face-to-face encounter with the legendary Komodo Dragon. Few people have met with these villages located high in the mountains of Flores and seeing them will provide a great experience in meeting these wonderful people. This, combined with unforgettable time spent with the Komodo Dragon will make this a trip to remember. Wae rebo village is located in the coolest rain forest. The tour will be combined with komodo tour. First, you visit the traditional houses in Wae Rebo village. Afterward, then you will enjoy the beauty of Komodo national park both land and underwater view. you will see the giant lizard in the island and of course the coral reefs, fish and so on for underwater view. Day 1. Labuan Bajo – Denge village (L,D). Our tour guide will pick you up at hotel / airport in Labuan Bajo, west Flores and drive through Lembor village. A small stop will be made in there to see the largest wet paddy-field in west Flores. Then continue the drive through the impressive panorama to Denge village. 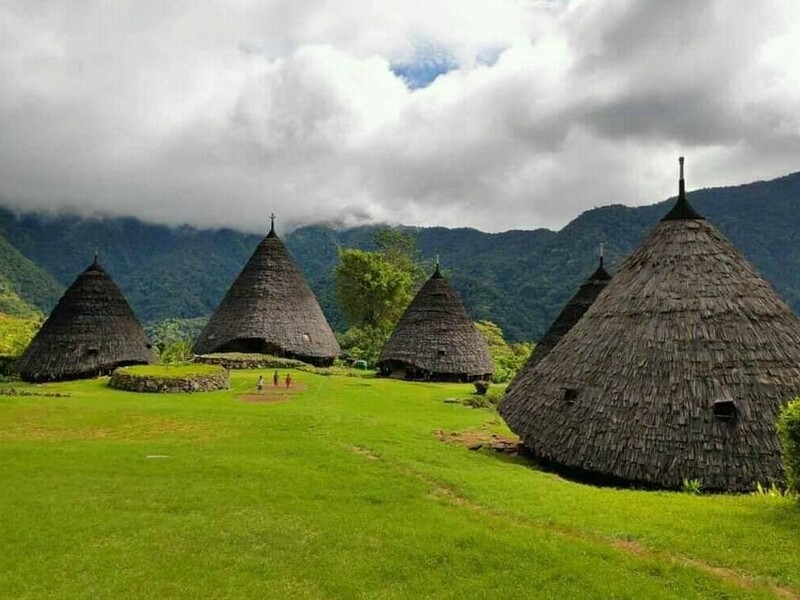 Upon arrival in Denge Village then start your trekking by approximately 3 hours to the beautiful traditional village of Wae Rebo. Lunch will be on the way, Dinner and overnight at Wae Rebo village. Day 2. Wae Rebo village – Denge village – Ruteng (B,L,D). Simple breakfast in Wae Rebo village, then see around and enjoy the village. Interacting with the local community is the way to get the real experience about their way of life. Leaving the village and trek down back to Denge village. Upon arrival in the village then drive to Ruteng village. The visit the local market or city sight-seeing on your down time in Ruteng. Then check into your chosen hotel. Lunch and dinner at local restaurant. Day 3. Ruteng – Liang Bua “homo Flores cave”– Labuan Bajo (B, L, D). After breakfast at the hotel you will depart to “Liang Bua” or “homo Floresiensis” cave. On your driving to the cave, you will have a small stop in a spot to see the terrace rice field. Then drive back to Ruteng to get your Lunch. After lunch, then drive to Labuan Bajo. On the way to labuan Bajo you will stop in Cancar to see the spider web rice field. Upon arrival in Labuan Bajo you will check in the chosen hotel. Dinner at local restaurant. Day 4. Labuan Bajo – Rinca island – Pink Beach – Komodo Island (B, L, D). After breakfast at the hotel depart to the harbor to catch your wooden boat. The wooden boat will take you the Rinca Island through the spectacular panorama of the island. Upon arrival in Rinca Island you will go on your trekking to see the Komodo dragon and other wild animal living in this island. Then boating to the impressive and spectacular pink beach for snorkeling, swimming or sun bathing on the beach. The boat will park around Komodo Island for your overnight on boat. Lunch and dinner will be on the boat. Day 5. Komodo Island – Manta point – Kanawa Island – Labuan Bajo (B, L, D). The breakfast will be on the boat then continue with another trekking in Komodo Island to see Komodo dragon and other wild life. This will be your another chance to see the giant lizard and the other kind of wild life. This island also as the home of ± 128 species of the bird. This could be your chance to see them. Then, boating to Manta point to see and swim with the huge Manta ray (could not be quarantined). Afterward, you will continue to Kanawa Island. This island with the spectacular view underwater. Snorkeling, swimming even relaxing on the beach are the activities that you can do. Then transfer to the harbor and check in to the chosen hotel. Lunch will be served on the boat. Dinner at the local resto. Day 6. Labuan Bajo – check out for your next destination (B).